Our classes are fun and instructive. Classes progress each week so that you can build up a portfolio of moves, whilst learning how to lead and follow your partner in the correct manner. We cater for absolute beginners, and you can come on your own or with a partner. Although we encourage rotation in the classes, we understand that you may prefer to stick as a couple. Our intermediates classes are pure fun and you'll learn great moves whilst enjoying the atmosphere and listening to great music. Bring casual clothing, flat soled shoes and a sense of fun, we'll provide the rest! except when there is a bank holiday Monday. 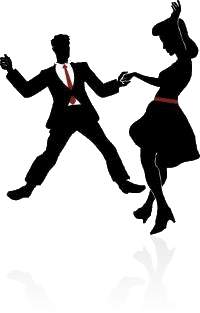 A stroll is a fun choreographed group dance to swing music; no prior dance experience is needed, and no partner is required as it is a solo effort. Examples are the Rock'n'roll stroll and the Shim Sham. Lindy Hop is a fun and energetic dance from the 1920's that has endured the test of time. Standard technique; you should be familiar with 6 & 8 count footwork. Spruce up your moves; you should be familiar with Charleston, Swing Out, Circle & Lindy Turn. You should have attended at least 8 beginners; variations of standard moves and new patterns for you to enjoy.